There were many _strange things_ around the time of Jesus’ birth—angelic appearances, shepherds announcing new kings, visitors from distant lands, and a maiden who became a mum. These strange things were all pointing to one momentous event—the baby in the manager who is ‘God with Us,’ the promised saviour and king—it’s strange but true. 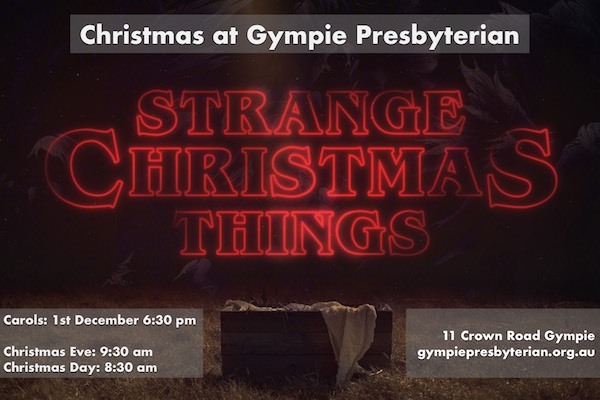 Please join us this Christmas as we reflect on _strange Christmas things_ and celebrate the coming of Jesus. Carols: December 1. Free sausage sizzle from 5:45 pm, Carols from 6:30 pm. If the weather’s fine we’ll be outside, so please bring a rug or chair.